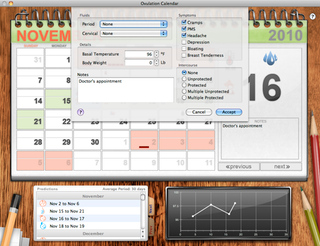 The Ovulation Calendar version is designed for the user with irregular periods and in need of more control over their cycles and the data entered. Clicking on any day selects that day. Double Clicking on any day will add or edit the data for that specific date. With the desktop version you will receive future cycles predictions, keep your Basal Temperature Chart and your Weight chart, export your entire calendar as an spreadsheet, export the predictions made by the calendar, etc, etc. 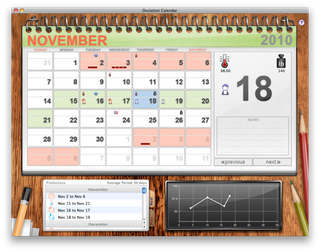 The Ovulation Calendar for Mac is available at the Mac App Store and you can download a copy using the Downloads section or clicking the App Store logo in this page.